Colours vary. One per pack. Amphibious flight and floatation dog toy with memory foam. Chuckit Amphibious Bumper is the ultimate floating and flying toy. 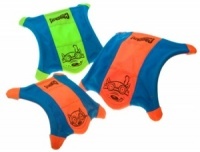 A totally unique range of dog toys made from a combination of memory foam and tooth-rugged nylon giving them superior flight in the air and high floatation in water. Certain areas are rubber lined to provide grip. 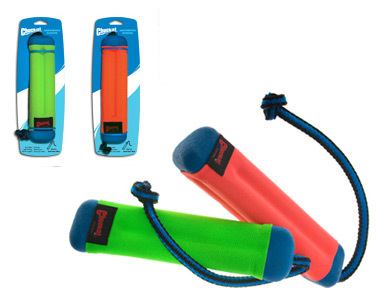 Easy on your dog's mouth but also tough and strong. 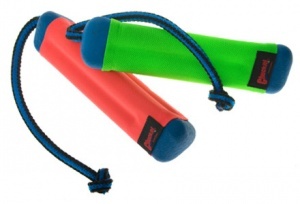 Memory foam has the ability to produce a light, soft and buoyant toy. The material is also durable and keeps its shape. The range is designed for exceptional visibility and performance. 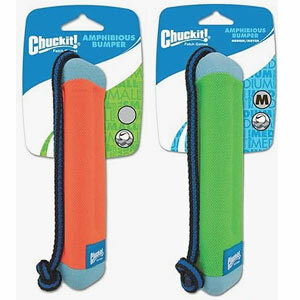 On land and in the water Chuckit Amphibious Bumper is a sturdy but soft dog training dummy. 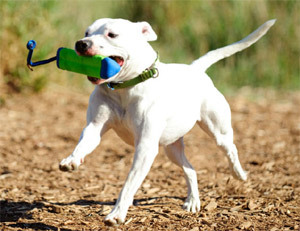 Chuckit Bumper is 23cm x 6cm x 6cm with a 25cm nylon rope handle. Rubber lined at both ends. The main part is memory foam covered in nylon. Impressed with Product and Service! My dog is a Ridgeback cross Husky/Wolf. Not a retriever or Labrador at all. 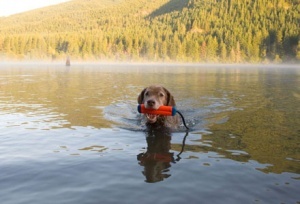 But throw her a Chuckit and she cannot resist swimming out for it AND retrieving it! 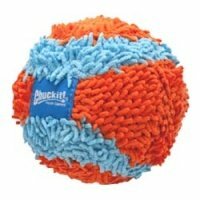 I am thrilled with this canine floating toy which can be chucked a good distance. Certainly durable and hardy as well. I have yet to try the toy with my retriever but it looks strong enough. However, because the picture showed two Chuckits I expected there to be two! Bought this to replace similar. My dog loves this retrieves it every time. It's a strong toy. Have to say that this is a great alternative to the pup playing with sticks. She loves this! It floats, it has held up to tug, it's bright so easy to see when I throw it in the sea.. My girls love it a lot. And the rope is still in one piece even though that's the main bit for playing tug with it, haha! If I were to lose this item I would 100% buy another. They're great. not completely indestructible, but lasts a reasonable time! The good thing about these is that even after my staffie has managed to tear into them and pierce the outer casing, or pull the end off, they can still be used until they have more or less disintegrated, and will still float. Not cheap, by any means, but a great alternative to sticks.